WELCOME TO DANISH MARITIME TECHNOLOGY CONFERENCE 2018 Concurrently with Danish Maritime Days 2018 in the first week of May, Danish Maritime and members of the organization are looking forward to welcoming you to the Danish Maritime Technology Conference on 2-3 May. ness and Financial Affairs Brian Mikkelsen and representatives from, among others, OECD, ABB, MAN Diesel & Turbo, Wärtsilä, VIKING Life-Saving Equipment, C-Leanship, and MicroWISE. 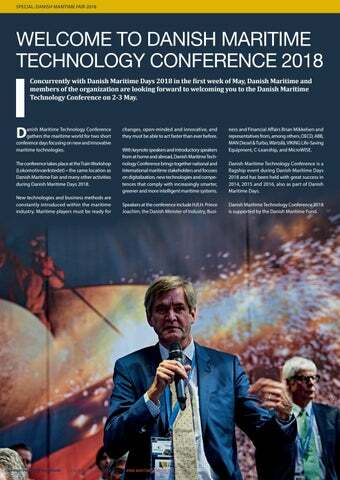 Danish Maritime Technology Conference is a flagship event during Danish Maritime Days 2018 and has been held with great success in 2014, 2015 and 2016, also as part of Danish Maritime Days. Danish Maritime Technology Conference 2018 is supported by the Danish Maritime Fund.